I miss the Digital output. could you check if there available with pavucontrol? maybe it's a pulseaudio issue. I have checked it and it is missing there, too. Problem still persists after update to pulseaudio-0.9.14. Tested with pavucontrol, too. what version do you use exactly? could you add a screenshot to the bug showing the issue directly rather than adding url to other websites? I use the latest Jaunty versions. Also added proposed and backports repos. Not having the digital output results in having totem _not_ playing AC3-files over S/PDIF. Instead I only get the 6 channel analog surround sound. Concerning the images, I let them on my server. When I find the time, I will upload them here. My guess is that pulseaudio needs some workaround/trick to recognize the digital output. Does it need an asoundrc file? I do not have one, yet. Just the defaults from the distribution. Could you try if that's an issue on karmic? > Could you try if that's an issue on karmic? I do not want to upgrade my stable system, yet. I just tested karmik alpha-5. "Settings for the selected device"
"Analog Surround 7.1 Output + Digital Stereo (IEC958)"
"Digitial Stereo (IEC958) Output + Digital Stereo (IEC958) Input"
I attach a capture from the dialog. 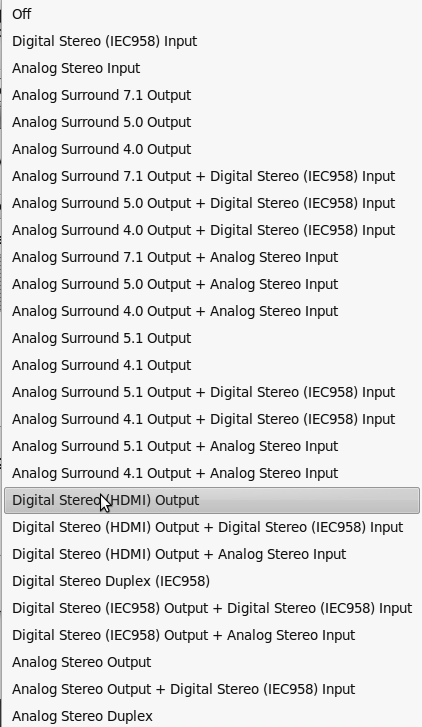 "Digital Surround 7.1 (IEC958 7.1) Output"